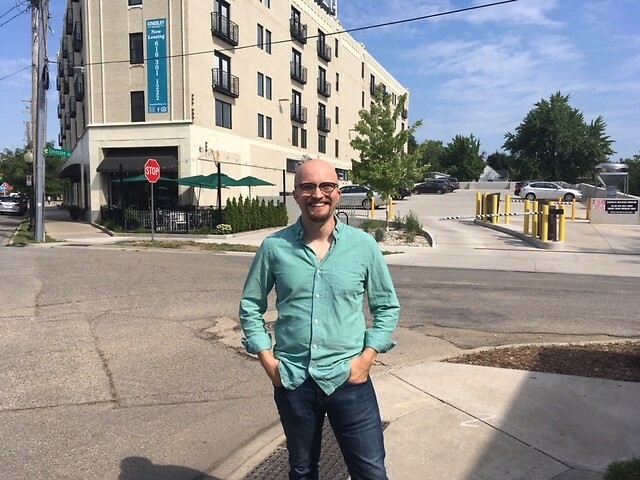 New WYCE station manager says Grand Rapids' music scene is "diverse and bursting with talent"
Musician Hayes Griffin will be the new station manager for WYCE. Grand Rapids Community Media Center is pleased to welcome Hayes Griffin as the new station manager for WYCE. Grand Rapids Community Media Center also includes Wealthy Theatre, GRTV, The Rapidian, Education and IT Services. Griffin hails from Ohio. He was born in southern Ohio near Chillicothe and lived most of his life in Columbus where he grew up. He graduated in 2010 from Denison University where he majored in music. He was heavily involved with the bluegrass music program there, which he calls his favorite genre of music. In 2012, he completed graduate school at the New England Conservatory of Music in Boston. For nearly four years after, he toured with Canadian fiddle player April Verch. After he finished touring in 2015, he played in a couple bluegrass bands. Around this time, his wife, Quinn Griffin, was hired at Grand Valley State University. That’s what brought the couple to Grand Rapids in Spring 2016. “I’m a pretty recent transplant but was familiar with the West Michigan scene before we got up here,” Hayes said. “Being in the music world, I was running into guys like Mark Lavengood who’s a Grand Rapids native when he was playing with Lindsay Lou and the Flatbellys. I actually went to Founders Fest in 2013 with those guys. It was a one off kind of thing so that was my first exposure to GR. In Grand Rapids, Griffin continued to play music. He plays guitar with local band Fauxgrass. He began as an adjunct professor teaching a History of Rock n’ Roll class at GVSU. “Rock n’ roll music has always been a passion of mine, from the time I was a teenager,” Griffin said. “That’s when I started playing guitar. I don’t know any teenage dude with a guitar that doesn’t get into rock n’ roll at some point." He also owns a transcription business called Built to Last Music Notes. In addition to transcriptions, it’s a multimedia digital learning platform. He does video and Skype lessons and writes books of transcriptions that people can buy. “I looked at the list of desired skills on the job description and it literally seemed like every aspect of my career that I have been trying to cultivate over the last decade,” Griffin said. In addition, Griffin knew about WYCE before he even moved to Grand Rapids. “It seems like the community members are rabid for this station around here,” he said. “Any music event that I’ve been to that was worth anything in Grand Rapids, typically has a WYCE logo in the background somewhere. WYCE creates so many meaningful partnerships with venues and bands in the community." “There are so many communities that want to interact with one another, they just need the kind of binding force to bring them together in GR,” he said. Music education and media literacy are both important opportunities for collaboration within the CMC and with the entire community, he added. Griffin also intends to build and strengthen relationships with GVSU media students to create internships or community outreach efforts with broadcast music students. As far as music is concerned, Griffin’s favorite type is bluegrass, which has a special place in his heart. These days, he is listening to western swing. How would Griffin describe the current music scene in Grand Rapids? “Diverse and bursting with talent,” he said. Although the population in Grand Rapids is smaller than Columbus, the music scene is far more diverse and exciting here, he noted.